It's been two weeks since the Camp fire broke out in Butte County, and the North Bay air is still filled with smoke from the catastrophic blaze that destroyed the town of Paradise. Or was that the town of . . . Pleasure? President Trump couldn't seem to get that fact straight when he showed up in California last week to implore residents to break out the rakes, just like they do in Finland, to stop forest fires in their tracks. Smokey the Landscaper, anyone? The presidential visit last week is worth noting for its awkwardness. There was Trump, sandwiched between a bewildered-looking Gov. Jerry Brown, and Gov.-elect Gavin Newsom, as the reality-show president bloviated about the fake news of climate change and blamed a lack of raking for the cataclysmic fires that have taken dozens of lives and destroyed thousands of homes. Trump's antics aside, serious people are now asking serious questions about how this latest round of devastation will play out for the Pacific Gas & Electric Company; press reports about the investor-owned utility have contemplated whether the Paradise fire will bankrupt the company, whose stocks have tumbled since the flames broke out on Nov. 8. The official line from PG&E is that the cause of the fire is under investigation. "The cause of the fire has not been determined," says PG&E spokeswoman Deanna Contreras, "so it is uncertain if we could be liable for any of the damages." Should PG&E continue to make the decision about whether to keep the power on when wind conditions pose a significant threat of blowing tree limbs into live power lines? Should that decision be off-loaded to state officials? Will the question be taken up by lawmakers when they reconvene in Sacramento to figure out a fire-free path forward? It's an open question that's got a "third rail" political quality about it, insofar as decisions about de-energizing power lines are currently PG&E's alone to make (it's a private corporation and not a state-run utility). The de-energizing issue was brought into harsh relief on Nov. 8, when PG&E elected to not shut down the power in Butte County and other Northern California counties (including parts of Napa and Sonoma counties) after announcing that it was planning to do so. In a statement on Nov. 8, PG&E senior vice president of electric operations Patrick Hogan wrote to the company's customers to thank them for their understanding "and for their actions in preparation of a possible Public Safety Power Shutoff [PSPS]. We know how much our customers rely on electric service, and we will only consider temporarily turning off power in the interest of safety and as a last resort during extreme weather conditions to reduce the risk of wildfire." The Camp fire broke out on Nov. 8. As the cause of the fire is investigated, PG&E defends its decision to keep the power on. "Regarding the Public Safety Power Shutoff situation," says Contreras, "beyond a Red Flag warning, there are a number of other factors PG&E considers when deciding to initiate a Public Safety Power Shutoff [PSPS]. These include strong winds, very low humidity levels, critically dry vegetation and on-the-ground observations by our crews." According to PG&E, "the forecasted conditions didn't meet the criteria" to initiate a shutdown in Butte County. In fairness to utilities such as PG&E, they're in a kind of "damned if they do, damned if they don't" bind when it comes to decisions about shutting down the power. The utility was blasted by Lake County leaders and businesses in October when it pro-actively shut down the power to some 70,000 residents under high-wind Red Flag conditions. No fire broke out, but one liability question for PG&E is whether shutting down the power is in itself an acknowledgement of potential wrongdoing on its part. In other words, why shut down the power if the utility's vegetation-clearance work, as claimed, is up to snuff? The current de-energizing protocols are part of the deeply controversial Senate Bill 901 from this year's session, which aimed to compel PG&E to address the "new abnormal" while not driving the utility out of business in the process by foisting all liability for wildfires onto it (and despite failures on PG&E's part to adequately remove vegetation from around power lines). The utility was found liable for several of the fires that broke out in California in late 2017. Among PG&E's high-powered friends in Sacramento is the lobbying organization Platinum Advisors, which was founded by Darius Anderson, a Sonoma County power broker who is also the founder of the nonprofit Rebuild Northbay. The Anderson-led nonprofit includes a PG&E employee on its board. The utility has been actively engaged in highly visible, subcontracted vegetation-removal work in the North Bay over the past few weeks. 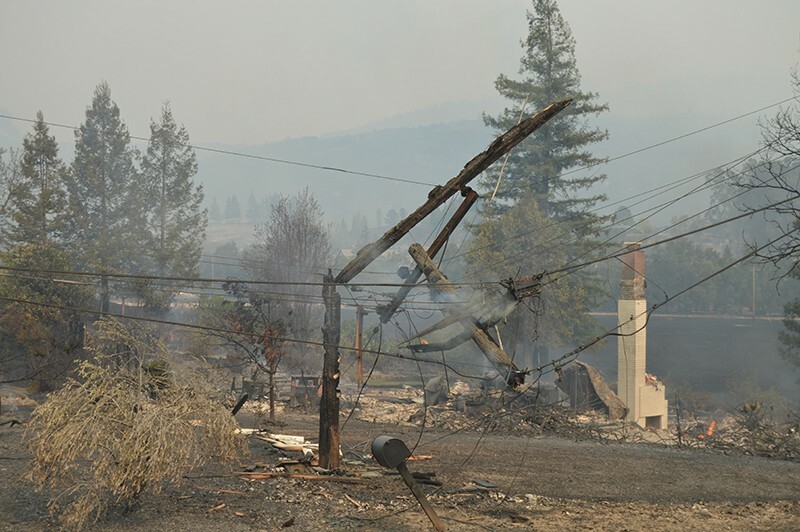 As currently regulated, PG&E's actions around de-energizing power lines are only reviewed in the aftermath of a decision to shut the power down. The state of California has no role in making the de-energizing decision, says Terrie Prosper, director of the news and outreach office at the California Public Utilities Commission (whose past leadership has been charged with acting as a rubber-stamp agency for PG&E's interests). Senate Bill 901 requires utilities such as PG&E to submit wildfire mitigation plans, Prosper notes; those plans are under review by the CPUC, as of Oct. 25. Under the current regulatory structure, the CPUC's role is to investigate utilities' decisions to de-energize power lines that distribute electricity to consumers; critically, the CPUC has no regulatory role in investigating a utility's decision to not de-energize power lines. The CPUC's role is not so much advisory as it is investigatory when it comes to de-energizing decisions. The utility is required to file a report within 10 days of the de-energizing event, says Prosper, "explaining their decision to shut off power, the notice that was given to customers and community representatives, the number and types of customers affected, the steps they took to restore power, and any other mitigation provided by the utility," Prosper says. "The CPUC may assess de-energization events that occur, and may take enforcement actions if a utility's actions were unreasonable." The shutoff protocol is "an additional precautionary safety measure implemented following [2017's] wildfires and is used under specific extreme weather conditions to further reduce the risk of wildfires," says PG&E's Contreras, "and is not deployed as a response to an active fire." The de-energizing issue is complicated by the nature of the power lines being considered for de-energizing, and the intersection of oversight of those lines, Contreras explains. High-voltage transmission lines are not part of the PSPS program and are regulated by the feds through the Federal Energy Regulatory Commission, and operated by the California Independent System Operator (CAISO). Transmission lines operate at higher voltage than distribution lines, and outages impact a much larger number of customers, Contreras says via email. The CAISO does allow utilities to de-energize high-voltage transmission lines (those that operate at 115 kV or above)—for example, at the request of Cal Fire—but only through coordination with the utility. "In light of the potential public safety issues resulting from de-energizing higher-voltage transmission lines, including the potential to impact millions of people and create larger system stability issues for the grid," Contreras writes, "PG&E has not extended the PSPS program to transmission lines that operate at 115 kV or above." The question remains: Will lawmakers de-energize PG&E's power to shut off the juice when the Red Flags start flying again next year? Correction: An earlier version incorrectly reported that PG&E was found liable for the Tubbs fire. That cause of that fire is still under investigation. We regret the error.